BJP National President Shri Amit Shah said the NDA government would soon launch initiatives to effect electoral reform, probity in political life and address black money in politics. Speaking at the release of a book on the life and times of Pt. Deendayal Upadhyay on 10 January, 2017 in Patna, the BJP National President said BJP would be way ahead of other political parties in adopting probity. The book ‘Deendayal Upadhyay Sampoorna Wangmaya’ has already been released by Prime Minister Shri Narendra Modi and BJP President Shri Amit Shah in Delhi and currently being released in all capital cities of states. Shri Shah said recent initiatives launched by the Modi government had been in consonance with Deendayal Upadhyay’s idea of Antyodaya (serving the last man in the queue). Our PM has decided to observe the centenary year of Pt. Deendayal Upadhyay as welfare year for the poor, he said. Shri Shah said it was because of Deendayal introducing sound methods to run a political party that a “small party worker like me could become the national president of the biggest party of this country”. Praising the Centre’s note ban move, the BJP President said that while some people would say that the decision was taken to please dhannaseth (rich). In reality, this move was not to please the ultra-rich people but for the benefit of the 80 crore poor people of India and to check tax theft. 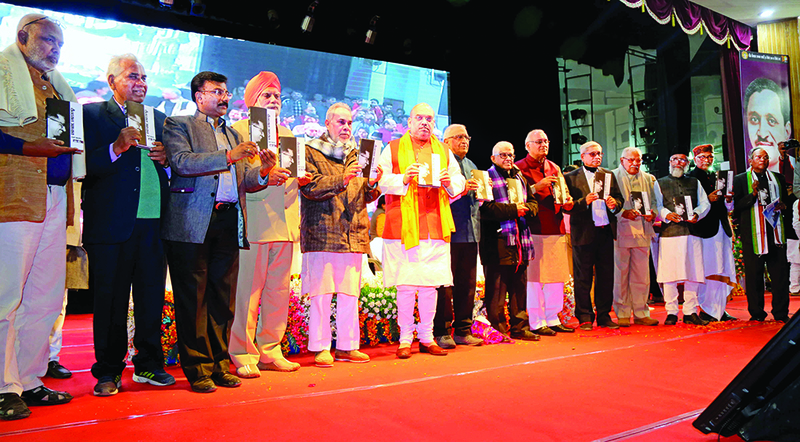 Shri Amit Shah said there had been a lot of discussion on probity in political life and black money in politics. “Hamari sarkar rajnitik suchita, chunav sudhar aur rajniti mein kale dhan ko khatm karne ke liye aandolan karegi aur jald hi yojana layegi (Our government will launch a movement and initiate schemes to address political probity, black money in politics and effect electoral reforms),” Shri Shah said. He said the BJP government was trying to explore if elections could be conducted without any expenses. He said, “After attack on black money through demonetization, some thinkers and experts asked Modiji what about bringing an electoral reform, set high standard of probity in political life and weeding out black money from politics”. Shri Amit Shah said after a successful strike on black money through demonetization, BJP, under the leadership of Prime Minister Shri Narendra Modi, has already started campaign to weed out black money from politics and bring major electoral reforms. “By stopping theft of cash, volume of budgetary provision for welfare of poor would be enhanced,” he said, adding the beneficiary programmes after demonetization would provide a platform to empower the poor. Shri Shah said the BJP has already set up a team to suggest widespread electoral reforms as how to achieve less expensive elections and make political donation transparent. He said the fundamental difference between the views of Congress and BJP was that while the former from the beginning after Independence has been working for “nav nirman” (new foundation) of the country on the basis of ideas influenced by the West, the latter always stressed on “punah nirman” (re-foundation) on the basis of the high ideals already existing in India. 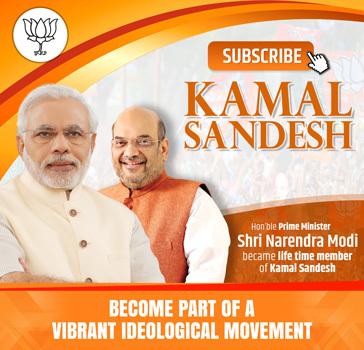 The BJP National President said BJP is the only party which launches andolan not keeping in mind some personality but on issues concerning poor and masses, he said and referred to the Ayodhya agitation and recent campaign to surrender gas subsidy so that poor could get LPG connections. BJP is the only party where election takes place on time within the organisation, he added. Praising the Modi government, Shri Shah said the Central government has set a target to provide bank accounts to 60 crore people who are still deprived of it, even after 70 years of Independence. So far 27 crore bank accounts under Jan Dhan Yojna have already been opened. On appeal of the PM, over 1.37 crore people have already given up subsidy on LPG to help poor get LPG connections, Shri Shah said. The editor of the book Dr. Mahesh Chandra Sharma, Indira Gandhi National Art Center Chairperson Shri Ram Bahadur Rai and other guests were also present on the occasion. The BJP President, who arrived at the Patna Airport at 11:00 am, first paid a visit to the Patna Saheb Gurudwara to pay his respect to Guru Govind Singh, the 10th Guru of the Sikhs. He was warmly welcomed by hundreds of party leaders and workers, shouting slogans with flags and head bands. Over 100 BJP supporters on motorcycles escorted Shri Amit Shah from the Patna airport. The BJP National President made a brief stop at the BJP state headquarters on Birchand Patel Marg in Patna where he was welcomed by BJP state President Shri Nityanand Rai. The BJP President Shri Amit Shah talked to state party leaders at the party office. Bihar BJP President Shri Nityanand Rai, Union Ministers Shri Radha Mohan Singh and Shri Ravishankar Prasad, Shri Sushil Kumar Modi and other senior leaders were present on the occasion.